Homemade Carp Bait Design – Formulating Your Own Recipes for Big Fish! Being able to formulate your own homemade carp bait recipes is such a powerful edge! Even if you happen to be a commercial bait maker, the same skills and knowledge and creativity apply. So how can you do it as a beginner or reasonably skilled bait-making angler? Read on for some great expert tips you probably will never read anywhere else! I speak to a number of commercial bait makers on a regular basis as friends, and I am intrigued at how there really is little difference between the process of formulating homemade baits compared to commercial ones. They both have to work on a variety of waters all year round and work instantly, and have the capability to out-fish competing baits due to special features, components or other actions or characteristics etc that they may offer. But do not be confused about the word instant. In fact highly nutritionally-stimulating baits can very easily have great edges over over-flavoured baits. Also, highly stimulating nutritional baits can be over-flavoured; many lines of concepts and approaches to bait design can cross-over, blend and enhance each other. This really struck me when I did some bait testing of various substances for Rod Hutchinson among others around the late eighties when I knew the boilie base mixes had been optimised for nutritional attraction, but were also used with sometimes very significant levels of flavours, and these worked extremely successfully for me as I experimented with different flavour levels! A good homemade bait maker will maximise his baits for maximum effect, whether he is fishing waters dominated by brands of popular readymade baits or not. One flaw of many anglers fixation with recipes is that you do not necessarily need highly complex recipes to catch loads of fish. For instance there have been countless occasions when a great flavour used in a very low nutritional value bait has caught the biggest fish in a lake long with very significant numbers of other fish. The butyrate in pineapple flavour for instance can be enhanced in various ways so that when it is used even very simple carbohydrate-based baits (which are really basically flavour carriers,) results are pretty good. Unfortunately there appears to be a mindset among far too anglers these days that for instance a yellow bait should mean it has a pineapple flavour. This kind of thinking really is hilarious and shows just how illogical thinking about baits by many carp anglers has become. For a start, why should you use a yellow bait, why should you use a bait with any significant flavour anyway, and even why should you even use a standard boilie bait at all? How many anglers even know which components within most pineapple flavours actually initiate any response by carp at all? How many anglers have figured out what tones carp most easily detect in what light and water conditions anyway? It takes work and often long experience to figure out such things in real fishing terms and not merely in theoretical terms. But so many anglers just want it all on a plate, given to them instantly, with a minimum of thought involved. Obviously this mindset leads to stagnation of thinking processes and development of development of the angler in many ways that ruins otherwise great chances and potential opportunities for catches that anglers are simply not aware of! And of course then the bait or rig or conditions or whatever else gets the blame for poor results! So for you thinking anglers reading this, (and I know you are many otherwise why would you be this article,) an enquiring mind is never satiated, just like a carp should never be satisfied after eating your baits; he should always want more and more! So now, how about me giving you a few suggestions for formulating your own homemade baits! What kinds of ideas might help you that might well make a difference? Well firstly, do not begin with recipes and do not begin with ingredients. Consider where carp live, how they evolved their bodies in response to the available nutrition they have had in their environment for millennia. Could it be that the availability of protein-rich mussel, snails and bloodworm for instance influence how external and internal senses and have become extremely sensitive to minute levels of excretions such organisms expel into the water column; thus making them detectable to hungry fish needing the nutrition within those organisms in order to survive. What about digestive juice excretions along the length of the digestive tract of carp and the efficiency of the wall of the tract to absorb digested nutrition; what natural substances and materials have influenced the optimum performance of this structure and the processes that are performed by the body chemistry, and physically too? When you begin your design with the fish and realise that everything in your bait must be detected by fish within a water environment not an air environment, that too really has a great bearing on your choices and decisions about how important different aspects of your bait will be and how to optimise your baits and their performance most appropriately. For instance it is far better not to boil you baits in water. Apart from damage to nutritional factors that stimulate fish feeding and habitual aspects about baits in regards to repetitive fish feeding, boiling in just water simply leaches out an enormous volume of materials that really should only be leached out when you fish with those baits. The skins of baits boiled in water are very much leached of attraction to the degree that the smell of the coagulated eggs in baits boiled like this are very obviously apparent; this is definitely not a good thing in the competitive world of carp fishing today, but much worse, you have lost performance! If you are boiling your baits and the water you boil you baits in is obviously pretty attractive after your boiling of baits that is an obvious sign that you have just lost loads of potential bait performance by losing substances you just leached out of your baits into the boiled water. If nothing else if you must boil baits, add things like molasses, or a sweetener, or enhancer or a syrup, or a soluble extract, or fruit juice or a puree or soluble fish meal, Oxo or Marmite or pure vanilla extract or maple syrup or whatever in order to replace something of what is lost! Ideally you will fast steam baits if you do heat you baits, but remember that heating baits to make hard baits is certainly far from absolutely necessary. It used to be the case that most leading carp anglers did their fishing using soft soluble paste baits; and these baits caught loads of record carp you know! So I guess you still want a recipe or some choices for recipes of your own to adapt. OK so you know that starting out your design from the fish perspective is the way to approach things. This means that literally everything you put into your bait has a very significant reason for being there! For instance, the core of a bait might be low temperature fish meal which is an exceptional digestible nutritional food source. You might decide to bind this with perhaps whey protein concentrate. This exceptional soluble milk provides extremely high quality protein among other factors. You do not need to get into first limiting amino acids etc unless you really do have all the technical data on every single ingredient in your bait; The vast majority of carp baits work in spite of not being optimised for digestion efficiency and much of the protein in high nutritional value baits is not digested nor assimilated for a variety of reasons anyway! Caseins have been a part of carp bait making for so many years. These have fantastic track record, and various forms can be combined to take best advantage of their impressive essential amino acid profiles which they supply to carp. 90 mesh acid casein for example provides soft centred baits for less dense, softer moister more soluble base mixes when made and can be utilised in an extremely wide range of bait applications. 30 mesh acid casein is a prime ingredient for many applications not just boilies, and pop-up or paste baits. It is ideal for harder more resilient baits against nuisance fish for example and helps binding. Casein has unique properties and a protein content in excess of 90 percent. Calcium caseinate has been traditionally used in boilies pastes and pop-up mixes in varying levels depending on the buoyancy and density and solubility required as it can be utilised to for all these purposes. It may be used at 4 or 5 ounces per pound in base mixes and even 6 or 7 ounces in buoyant baits. Soluble milk ingredients are a very significant part of carp bait history through the decades so you can imagine how important they are. I will diverge a bit here and just say you can make a very effective bait just using ordinary wheat flour, betaine, a liquid amino acid, vitamin, mineral and trace element complex along with a subtle flavour, plus maybe additional enhancers, bioactive and metabolic factors, maybe enzyme active substances, and a mixture of protein-based and carbohydrate-based sweeteners. In other words you can easily make fish respond to baits even if they are not high in protein. You base mix does not have to be high in protein at all. In fact it is pretty obvious that much of the proteins available in the very high protein baits of the seventies era for example could not be utilised by carp due to limiting factors for one thing! Protein ingredients are certainly stimulatory to carp; in fact carp are exceptionally sensitive to the key amines they require for basic survival as the providers of the building blocks of life. They contribute to the make-up of essential substances in carp and humans too, for things such as transporting oxygen to where it is required in chemical processes, and in the production of digestive juices for example. Yes proteins are very vital for life, but certainly not the only answer when formulating successful fishing baits for carp, or catfish, or barbel, or tench or whatever. I say this because for example, these fish and individuals within each fish species and strain are taste specific, meaning they are more sensitive to various taste substances, and different smell-related components. For example you can do very well on a bait with a particular flavour, but then if you add a particular edible dye in order to produce a highly visual bait you can easily transform that bait into a different maybe less successful bait due to the E numbers in the dye masking significant triggers and attractors within the bait, and such E numbers may even prove to be repellent even though they are classed as edible! Remember that carp are more than doubly as sensitive as dogs OK! So here is some more food for thought, and I hope this has got your little grey cells buzzing! Revealed in my unique readymade bait and homemade bait carp and catfish bait secrets ebooks is far more powerful information look up my unique website (Baitbigfish) and see my biography below for details of my ebooks deals right now! Carp Fishing Bait Expert Tips For Outstanding Big Fish Success! 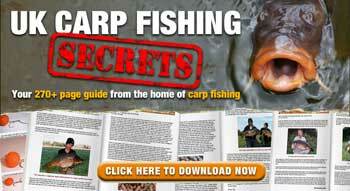 Home Page > Sports and Fitness > Fishing > Carp Fishing Bait Expert Tips For Outstanding Big Fish Success! Do you think it is all too easy to just choose a fishing venue, buy some bait, cast out and expect to catch the fish of your dreams; and then wonder what went wrong on your dream holiday? Here are some very practical ways to make your dream holiday and holiday baits work big-time for maximum big fish success. Why waste your time hoping when you can genuinely create your own guaranteed success? Read on now! I have fished enough decades now to know that success is not just in having a bit of luck but in the planning ahead! Not so many anglers seem to want to really put the effort in to actually create their pretty much guaranteed success on a level far beyond the average; but that is often the vast difference between average anglers and those who seem to have golden balls right! The fact is that most of the best are living breathing dreaming and walking driving working their fishing with it on their mind all the time, no matter what else they might happen to be doing! With that kind of intensity of focus on your goal there really is only one outcome possible and that is outstanding success! Here is just one example from one of my trips abroad. I booked up to go to a lake where at the time the biggest fish in the world had recently been banked. So all I did was find out where the biggest fish lay up after capture- which happened to be the most unpopular swim on the lack obviously, as most fish there are just too stressed to want to feed on baits very willingly anyway, and then I fished the spots most likely to be visited by that target fish. I fished my lines at totally different angles to those the majority of anglers would use, and used baits that no anglers had ever used on that water. These baits were homemade and of my own design. I think bait is so vital in success yet relatively few anglers on the bank even know how and why they work in various levels on fish senses and internally. But knowing this kind of knowledge puts you leagues ahead of guys who simply are ignorant and cannot leverage the power of this; it is a massive competitive edge that will lead to you out-fishing more talented and more skilled and more experienced better connected anglers! Being able to design your own unique baits and having the bigger picture about baits and how they work and can be created to work in all kinds of very unique ways really means that even if you choose to use readymade baits of any form, that you will be able to improve them, adapt them and apply them in ways that mean maximised effects on fish – and achieve success far beyond average anglers using baits in dips or straight from the bag! You see can use the popular baits that appears to be dominating a water yet still be out-fished by the guy who fishes a completely new bait that the fish have never ever experienced before! It took 9 days to hook that big fish but wow was it worth the wait. That fish was the one I had most wanted and to hook it and then see it up close was simply mind blowing! That fish gave me the pulling me off my feet fight experience of a lifetime! But the fact is I would never have hooked that fish unless it had felt safe enough to feed on my baits. How I applied my free bait and what I actually applied was extremely central to my success! Really big fish have extraordinary requirements for factors in their diets that make them pretty vulnerable if your even exploit just one potential deficiency. But many factors can be exploited to get cautious fish to feed, that are not even directly related to dietary needs as such, but trigger feeding responses for a wide range of reasons to do with biofeedback and instinctive responses of many kinds on many levels. For instance you might choose a totally different alternatively-based bait that contains a seriously refined banana oil very rich in potassium. You might choose to use a base mix very high in pure resveterol, or use a new or different form of prebiotic or choose a new alternative form of probiotic so your baits really packs a punch! Simply combining a more familiar flavour with liquid lecithin and a combination of essential oils, or just a more newly available terpenoid or an alternative oleoresin can be a truly great edge! Even using a bulk concentrated flavour which has been prepared in a lower concentrated form that is normal, and including 5 times the normal dose can be extremely effective. As a side note here, most anglers seriously under-dose when using many of the better-known essential oils. You can go much higher by including liquid lecithin for example from CW Baits. Just one alternative ingredients or combinations of unusual ingredients make such a difference! Certain products are very rich in lycopene, or beta-carotene for example! Just one single alternative edge might well be all the edge you need apart from presenting your baits as unheated paste or just scalded baits, maybe used as tiny pop-up and balanced baits on multiple hairs instead of big 15 or 18 millimetre diameter balls, cylinders, pellets or other more usual shapes. Big very wary fish have a rather skilled habit of selectively avoiding baits of sizes and movements and other characteristics and properties that have hooked them before. That is why you are far more likely to catch the fish of your dreams using alternative recipes. For example on a couple of small liquidised mussel and water snail paste baits bound with various nutritionally-stimulating binders, boosted with natural extracts and with additional koi pond clay as an alternative nutritional source for example, and simply moulded into rough squares of 10 millimetre diameter, instead of conventional round or pellet shaped boilies of larger sizes. Being different is the way to catch the big wary fish. It is the greatest edge in fishing of all kinds and yet most anglers are not fishing much different to their fishing neighbour! It takes the right knowledge to be able to leverage the right kinds of being different, especially when it comes to baits and bait applications and readymade and homemade bait adaptations and designs and so on, but they will make a massive difference to your success, especially against better anglers or even against anglers with more time and resources than your have. It is not just what you know, but in knowing how to best use knowledge to maximise and even to create great fish-catching opportunities, that the average angler is ignorant of! Revealed in my unique readymade bait and homemade bait carp and catfish bait secrets ebooks is far more powerful information look up my unique website (Baitbigfish) and see my biography below for details of my ebooks deals right now! The home of the world-wide proven homemade bait making and readymade bait success secrets bibles and more unique free bait secrets articles by Tim Richardson! How many calories in a bk big fish? I’m allergic with soy product..can i take whey protein isolate with soy protein or soy lecithine as one of the ingredients ? What are the benefits of fish oil pills? Spinner baits are useful for catching crappie, bream, yellow perch and other panfish, especially during periods of cool weather when fish are slow to bite. Whether you’re standing all morning in a mountain stream or vigorously hiking the several miles it takes to get there, you need reliable rainwear. Fortunately, fishing rainwear can be the same as your other rainwear – just keep in mind the activity at hand when comparing features. Fly fishing tackle refers to the tools and equipment used by fishermen that participate in fly angling. They include a number of gears such as the fly lines, reels, rods, artificial flies, and other tools specialized for casting. By the way, this type of fish-catching activity has seriously become popular. Is fishing an activity that you would not miss for anything? If true, how prepared are you to succeed in it? Every job requires tools and equipment in order to be possible. In spite of everything, one must aim at finding the right equipment for fishing. Numerous American kids and adults are seriously learning the skill of fishing. Catching a big marine animal for the first time makes a person so proud of himself or herself. The activity of fishing, however, is quite complicated or impossible without the use of correct tackle. Many aspiring fishermen have many things to learn. It takes practice and research to get ahead in fishing as a career or a leisure activity. For instance, learning about fishing tackle is very basic and important. Tackle refers to any equipment or gear one would use for doing any fish-catching activity. Numerous outdoor activities that you can do in winter are available. For instance, you can help your family try ice fishing. All you have to be cautious of is the harsh climate that can cause ill health. When preparing this kind of activity, you need to buy the right tackle. Having the correct ice fishing traps is the way forward. Fishing is a commercial activity done at an exporting level in some countries. In other countries, fishing seems to be a leisure activity for most people. In the U.S mainly, both adults and kids love catching these creatures. How To Make Chocolate Malt Carp Fishing Boilies For Winter And Spring Success! Revealed here are very unusual powerful bait recipes for winter, spring and cold water big fish success! Chocolate malt is a popular flavour now. I have made my own versions of these baits and flavours as homemade baits for about 25 years. That is a lot of winters and springs to test what truly works so read on and reap more cold water rewards now! Carp And Catfish Fishing Baits Secrets – How And Why They Really Work! Many anglers think that talking about bait is a waste of time because they would rather be catching fish and they miss the point that to achieve good catches of fish means actively overcoming the fact that fish catch up with our baits and fishing activities owing to their naturally programmed survival instinct! So if you want to catch more fish this year then further educate yourself now and read on! How To Make Carp Boilies And Fishing Paste Baits Using Pineapple Flavours and Butyric Acid! So you are looking to produce some incredibly effective economical paste baits, or boilies or pellets for this winter and spring? Pineapple is so popular but these extremely potent homemade baits described here are so different! These ideas and recipes will really prove their worth even as free baits or paste wraps around your favourite readymade boilies etc; so read on now! How To Catch More Winter Carp By Improving Your Fishing Baits! When you think about it we all know that winter conditions will severely impact on fish activity, how can we improve our bait impacts to maximize fish responses, induce fish activity and fish feeding activity proactively? This article is new and unusually revealing; so whether you use readymade baits or wish to get into making your own homemade winter baits this reality-based highly practical article is for you so read on now! Homemade Carp Fishing Bait Recipes Using Pineapple Flavours And Readymade Boilies! You will be the first to ever have access to these new unique pineapple recipes and unique fishing method; so I suggest you use them as soon as possible on your next trip! I highly recommend that you use them (or even play around with them,) and exploit them as much as possible to fool those big wary fish you always dreamt of catching! Read on for far more information now! Proven Carp Bait Recipes For Autumn And Winter Exploiting Big Fishing Success Secrets! Get real about carp baits! Think about it; everyone can do better than they think they can, if they only knew how! Finding that inspiration, that bit of the puzzle, that makes all the difference! If you want to do far better you need to open your eyes and mind to make way for new fresh information, and break old out-dated patterns and shed old thoughts that are blocking your success. This is how top sportsmen reach the top. Read on and be inspired! How To Make Pineapple Winter Carp Boilies And Homemade Baits Based On Addictive Ingredients! Many of you are asking how to make boilies and want unique new recipes. So here is just one simple and easy to make but nutritionally sophisticated highly attractive bait for autumn winter and even spring and summer! This bait uses the attraction of the major component within pineapple flavour and makes a totally alternative superior pineapple nutty bait option just as good if not better than most so as it is so different; so read on now! Home Page > Sports and Fitness > Fishing > How To Make Chocolate Malt Carp Fishing Boilies For Winter And Spring Success! Flavours are an exceptionally popular topic of interest among anglers on the bank! Chocolate malt is a flavour that I and friends of mine plus many other anglers in the know love to exploit! Many anglers today use chocolate malt flavour readymade baits, but you can make even more potent versions! If you have read any other of my hundreds of bait secrets articles all over the web now, you will have realized that bait and nutrition, and bait and achieving far more bites are certainly not necessarily the same thing! Nutritional baits catch fish sure, but baits optimized to achieve the maximum numbers of chances of bites are far more successful! What I mean by this is that nutritional stimulation is merely one avenue or approach to exploit within baits in order to achieve a situation where fish mouth your baits and subsequently get hooked! A great many baits that have exploited chocolate malt flavour over the years have not been designed as nutritionally stimulating baits at all! Instead the vast majority of chocolate malt readymade baits have relied upon the impacts of the high levels of flavour within relatively low nutritional value under optimized base mixes. Protein components just keep on getting more and more expensive. So the aim of bait companies to achieve more profits leads many to cut down on protein and use alternative options to achieve bites and of course utilizing high flavour levels is just one approach that has great success! These days more and more bait companies are competing so are looking at ways to incorporate competitive edges within their baits at low cost. Some ideas below will cover some ideas as many of these substances mentioned cost less than using protein rich additives and ingredients. The success of your bait certainly does not have to be due to how rich the concentrated proteins within your baits are in terms of feeding triggers and attractors; endless other options are available that truly work, even when fished against protein rich baits! The original successful chocolate malt flavour that came to prominence was the one conceived by Rod Hutchinson, the flavour supreme extraordinaire! This was the chocolate malt flavour I chose if I was thinking about a bait of this particular emphasis, but the homemade base mixes I used were very open texture because I wished my flavours to leach out in great concentration and catch me fish as efficiently as possible! For winter I used various very soluble additives and ingredients to assist in the leaching of attractors and feeding stimulants alongside the concentrated flavour. An example of this would be malt extract, which is a highly under used additive these days. Another additive I would use today in such a bait is vanilla extract meal. Personally I like to keep things different but certainly not just for the sake of it. For instance today if I was to fish against a readymade chocolate malt bait there are very many options I would exploit to design a vast array of competitive edges into my homemade baits. These edges very much would relate to the potency of the bait, its instant and cumulative bioactive effects and metabolic effects and this will include potent prebiotic and probiotic effects, things that will speed the throughput of bait through fish, assist digestion, increase bait palatability and impacts intensity and duration and so on. For cold water the ways you bait substances in combination react in water are a massively crucial part of your bait! Cold water baits are well known to be more successful when you include an intense sweetener. Such a sweetener has multiple effects and impacts apart from its role as a flavour enhancer. Such sweeteners strengthen the intensity and duration of other flavours and improve bait palatability which in turn encourages carp to feed on more bait more repeatedly, even in low water temperatures. Obviously further repeated feeding equals more chances for fish to make mistakes on your hook baits! As the focus of this article is on the flavour not base mix just a couple of suggestions will be mentioned in this regard. It is desirable to give your fish multiple impacts on multiple senses so utilizing various substances combined is obviously a very sound suggestion. So for example I would use a sweet or milky or another type of powdered palatant in my bait. I might use a very specific appetite stimulator and the profile of these can very enormously. SBS baits for example have a very well proven range. Appetite stimulators are extremely under exploited simply because the masses have not figured it out that a bait built on a range of incredibly potent feeding triggers which also happen to be seriously potent enhancers is a very serious edge over fish caution and resistance to being hooked! They really do promote that vital just one more effect when experienced by carp! As for flavours I like to make things unique in my baits while ensuring plenty to attract carp and create interesting profiles and richness within baits and substances leaching off. If you are fishing a water where chocolate malt has been used previously then why not create new flavour with a unique profile and effects. You might well consider trying mixing 2 different brands of chocolate malt flavours together, with each on a different base. You might decide to add a different dimension perhaps, by adding a butter or cream or scopex or milk flavour. Personally I would add a little butyric acid also. In a chocolate malt bait you might include extras into you bait that will certainly enhance the palatability and solubility and effectiveness of your bait. Many malted drinks are very effective and include milk protein and sugar fractions and further enhancers such as salts. These tend to be very fine which is great but they have a certain oil content so I would mix something else to it that is also fine; such as icing sugar to it for cold water use. I would include a milliliter of Thaumatin (the trade name is Talin) at least per 1 kilogram of your dry powder base mix. Other things I would add in whatever combination of ingredients and additives you might choose for your base mix I would include are molasses meal, betaine HCL and also in with your liquids, some high potency liquid lecithins from CW Baits. Vanilla is probably the most popular flavour in the world yet it is strangely ignored by 99 percent of carp anglers today. The real vanilla extract liquid is very useful indeed but often in pretty weak alcohol base. Alcohol is a very soluble easily dissipated form of solvent and carrier for natural flavour components. However it is possible to create real vanilla flavour by steeping and heating vanilla pods to draw out their awesomely attractive oleoresins. Traditionally chocolate, vanilla and chilli are well connected for many reasons through history and culture and with very good reason. In fact a few drops of capsicum essential oil for example works very well in a sweet homemade chocolate malt bait! For more information on what kinds of substances are most potent in designing your base mix for cold water boilies, pellets, particles, ground baits and so on read on. You might think that chocolate malt just refers to boilies, but it most certainly does not! What about chocolate malt sweetcorn, or tiger nuts or luncheon meat, or spod mix or PVA bag mix, method mix or boosted paste? How about this little idea: Defrost some prawns in a mixture of soluble fish protein, vanilla extract powder, betaine HCL, raw molasses, wheat bran, powdered palatant and other appetite stimulators and chocolate malt flavour. When you begin, add some dehydrated prawns and maybe insect meal, a little chocolate powder and instant coffee powder, silkworms crushed plus some chopped up vanilla pod. When your prawns have defrosted and all materials have soaked in all together, crush up your prawns and then add some PVA friendly liquid food. Examples could include CC Moore corn sweet syrup, plus a little liquid chilli extract and added chilli flakes. Maybe you might try liquid salmon and krill extract with added glycerine, Butyric acid and Talin. Such suggestions are all good, but merely the tip of the iceberg of what I know is possible and certainly baits can be made incredibly far more potent! I really seriously rate using big PVA bags filled with suggestions like this. I make mine to pack such a uniquely potent punch I can tell you it makes me smile knowing just what is hitting fish externally and internally in concentration is actively altering their brain chemistry, muscular state, changes of behaviours and states of arousal and feeding modes! I do not simply go to bait companies for my ideas and materials though. Herbalists and suppliers to the massage and holistic healing and health food type businesses offer many extraordinarily potent substances that could well be new to your consciousness as having potential in carp baits! You might think that chocolate malt just refers to boilies, but it most certainly does not! I could suggest trying betal nut products, and endless other products to induce special energizing impacts in feed to induce boosted feeding activity especially required in low water temperatures! What about chocolate malt sweetcorn, or tiger nuts or luncheon meat, or spod mix or PVA bag mix, method mix or boosted paste? How about this little idea: Defrost some prawns in a mixture of soluble fish protein, vanilla extract powder, betaine HCL, raw molasses, wheat bran, powdered palatant and other appetite stimulators and chocolate malt flavour. When you begin, add some dehydrated prawns and maybe insect meal, a little chocolate powder and instant coffee powder, silkworms crushed plus some chopped up vanilla pod. When your prawns have defrosted and all materials have soaked in all together, crush up your prawns and then add some PVA friendly liquid food. Examples could include CC Moore corn sweet syrup, plus a little liquid chilli extract and added chilli flakes. Maybe you might try the new liquid krill extract and add glycerine, Butyric acid and Talin for an awesome unique spring chocolate bait! I say much more about this on CC Moore TV each month as a consultant describing how and why to use a massive diversity of various substances to trigger feeding in many potent ways and also gain incredible competitive edges over competing baits! This is all great stuff but this is merely the tips of the iceberg of what is possible and certainly can be made incredibly more potent. It really does pay to keep an open mind! Revealed in my unique readymade bait and homemade bait carp and catfish bait secrets ebooks is far more powerful information look up my unique website (Baitbigfish) and see my biography below for details of my ebooks deals right now! How many calories in a chocolate malt ? Is there any seminars or workshop i can attend to learn how to make chocolate bouquet? Should you capitalise the seaons? Summer, winter, autumn, spring? An in depth review of the G loomis Current fly reel. An in depth review of the Sage Z Axis fly fishing rod. An in depth review of the amazing G Loomis Streamdance GLX fly fishing rod. An ice fishing house is a simple structure that can be created by just about anyone with basic tools and a willingness to actually do it. Generally an ice fishing house is just a simple six by ten structure with holes in the floor but it can also be as complex and as luxurious as you want it to be. With a little bit of planning, the right materials and tools for the job you can make and plan your own custom design for and ice fishing hut. slamming bass at will this season. Numerous people love fishing as a leisure activity. In the process, some of them become expert fishermen. By this time, they already know various behaviors of fish and how to attract them. In other words, the more one catch fish, the easier it becomes for him or her to know the most effective baits. The worm fishing bait is a very effective style and almost any successful angler has tried it. Have you ever tried the fly-fishing sport? In the U.S, this sport is becoming very popular in many regions. People are even willing to attend lessons to become expert users of this artificial fly lure. The artificial fly fishing bait, as the names suggest is just an imitation of a real insect. This type of bait involves use of feather, hair and threads to sculpt something that looks like an edible prey. How To Make Carp Fishing boilies Using Easy Cheap Recipes That Beat Readymade Baits! If you are ready to take the sensible step of making your own homemade boilies and pellets, now is an ideal time. Having been writing on this subject full time for the past 5 years means I know the interest in this subject has seriously grown recently as more and more anglers want to make their own baits and cut their bait costs. So join the new crowd and read on now! Really catchs fish-Any size fish! Catch Fish from the shore, dock or a boat! Great Fishing Fun for all ages. Fishing with, RC Fishing World’s ” Remote Control R/C Fishin’ Boat” and caught the catfish. 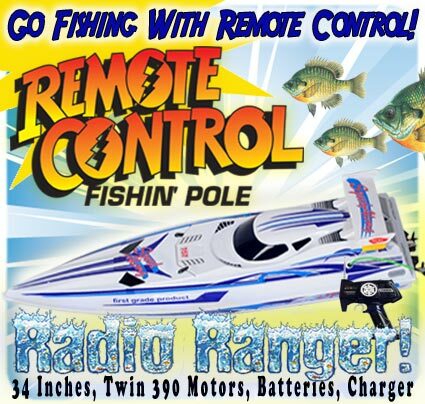 www.rcfishingworld.com The big fish get caught with a Fish Fun co .”RC Fishin’Boat”! Cant wait to do another adventure! Catch a catfish that big you can catch any size fish, LOOK for “RC Fishing World” on the internet!